The temperatures are rising and the summer heat is setting in. Here in the northeast we went from winter straight to summer. 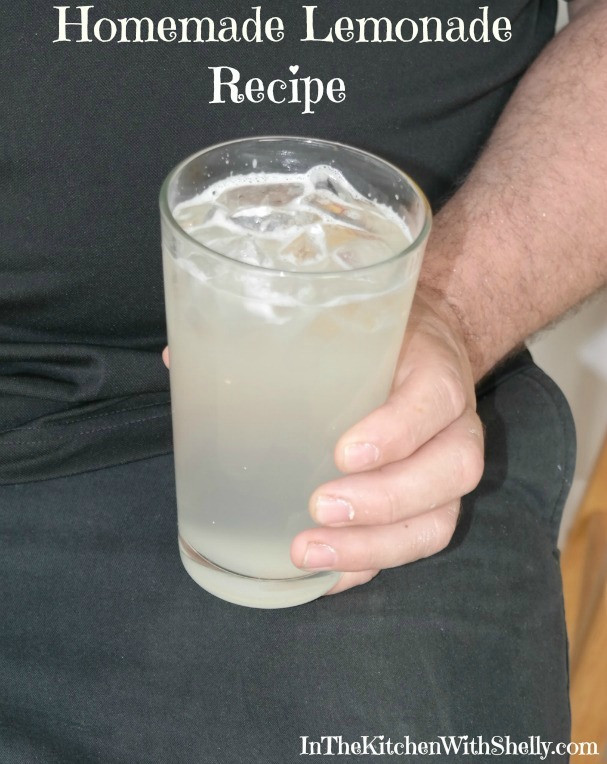 Along with summertime comes my addiction to a good homemade lemonade. While store bought lemonade is okay in a pinch...I am all about the good stuff you make at home. 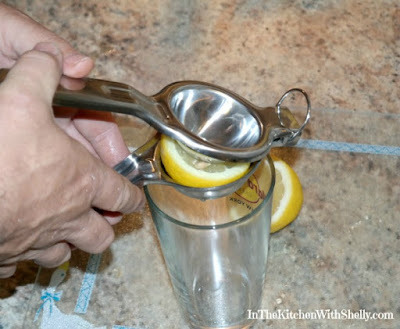 When it comes to making a delicious homemade citrus beverage it is important that you start with the freshest fruits possible and you need the proper tools like the Professional Lemon and Lime Press from Kitchen Frontier. The lemon & lime press is made out of commercial grade stainless steel. It is ergonomically designed, naturally non-stick, features a large bowl and is dishwasher safe. The company sent me a complimentary one to review for all of you, so I decided to test it out while whipping up some homemade lemonade. If you are familiar with the style of lemonade sold on the boardwalk at the Jersey Shore...that is exactly how I make my own lemonade. Tip: To get the most juice out of your citrus fruits you will want to gently roll them a few times on your countertop with some gentle pressure. Measure out the granulated sugar and place it in one of the tall beverage cups. 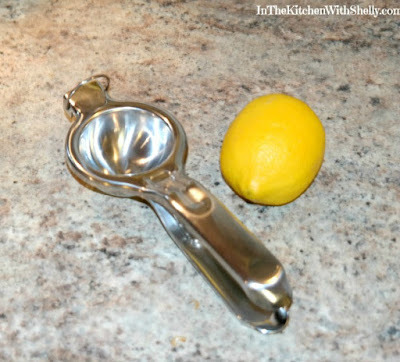 Slice your lemon in half and press out the juice using a lemon press into the second beverage cup. Repeat with the second lemon half. Add cold water to your freshly squeezed juice. Place the two beverage glasses together (or use a cocktail shaker) and shake the lemonade up...rocking it back and forth between the two glasses. Do this for 20 seconds, trust me...that time makes a difference! Add ice cubes and enjoy! Kitchen Frontier has a great offer for all of my Shakin 'N Bakin Foodie Blog Readers!!! 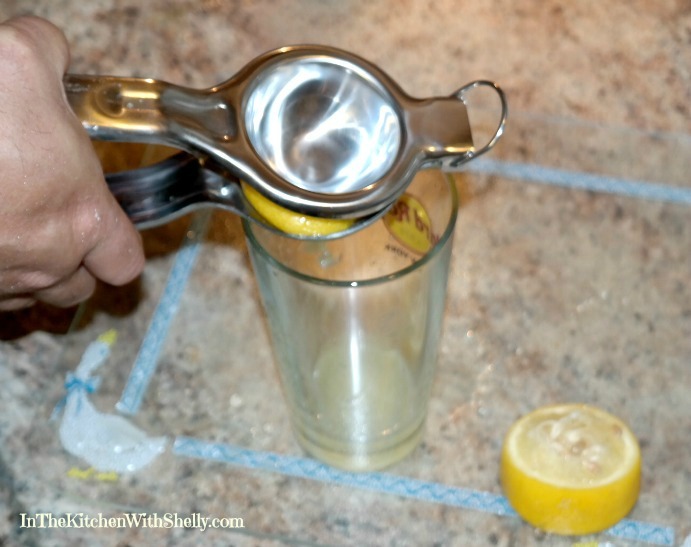 50 of my readers, family and friends can get the same Professional Lemon and Lime Press that I got to review (regular price $18.50) for only $1.00. Yes, you read that correct!!! * Click here, enter your email to get the coupon code. * Click here, add to cart. * Enter the coupon to get it for $1. If it doesn't work it means the deal is finished. * Shipping is FREE for Amazon Prime members. Otherwise it's not free! Thank you Kitchen Frontier for sponsoring this review and this exclusive offer for the Shakin 'N Bakin Foodie Blog readers. Disclaimer: Shelly H. has personally reviewed the product listed above. Shelly has not received any monetary compensation for her review. Shelly did receive a free product to try out so she could evaluate and use it for her review. Her thoughts & opinions in this review are unbiased & honest and your opinions may differ. This is such a great deal for a lemon press. Unfortunately i just bought one a month ago. I love to make lemonade and lemon iced tea in the spring and summer.